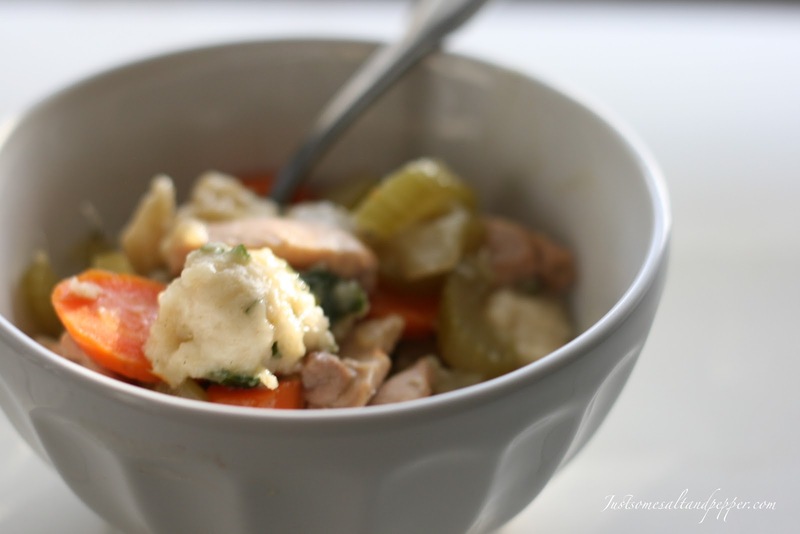 What screams comfort food more than chicken and dumplings? This recipe if perfect for a cold wintery night. Unfortunately we haven't had any of these days yet in MA. Now that I am on break until mid-January, I could go for a nice big snowstorm because I don't have anywhere to go! Knowing my luck, we will probably get one as soon as I go back to school and they won't cancel! I got this recipe from Cooking Light and had some trouble with figuring out the points. On the Weight Watcher's site, they have chicken thighs as being way higher in Points+ than the nutritional information states. I know there is no way boneless skinless thighs have almost 19 grams of fat and decided to ignore the nutritional information in the tracker and use the information everywhere else. I normally figure out the nutritional information independent of the points and then enter it in the tracker to see if they match up. I skipped that part because clearly something is going on in the tracker! 1. Spray a large saucepan with cooking spray and heat; add chicken to the pan and brown on all sides for about 4 minutes; remove from pan and keep warm. 2. Add carrot, celery, onion, parsley sprigs, thyme and bay lef to the pan and saute until the onion is tender, bout 5 minutes; return the chicken to the pan and cook for another 1 minute; add broth and bring to a boil; cover and simmer for 30 minutes. 3. Meanwhile, in a medium bowl, spoon flour into a measuring cup and level with a knife; combine with the parsley, baking powder and salt; add milk and stir until just combined. 4. Spoon by heaping teaspoons into the broth mixture; recover and simmer for another 10 minutes, or until the dumplings are done. Before serving, remove bay leaf and parsley sprigs. This is totally my kind of comfort food.